Keeping a divorce amicable is the goal we hope everyone has when approaching a divorce. The ideal that you and your spouse can dissolve your marriage easily with simple, peaceful discussions is a fantastic one. Anyone who has the personality type to accomplish this goal should be proud of themselves. The problem is that, having an amicable divorce is far harder than most people think it will be. 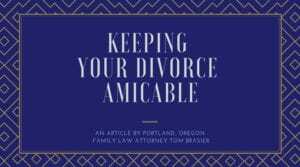 Hopefully here I can give a few ideas to help people reach this goal and keep your Oregon divorce amicable. 1. Be prepared for your emotions. An amicable divorce is an emotional state more than anything else. Before you commence your divorce, in order to have an amicable divorce you will want to really prepare yourself emotionally for what that will require. It will likely require many concessions on your part. Concessions you likely won’t be happy with, often because you feel the other person doesn’t deserve the thing as much as you do. 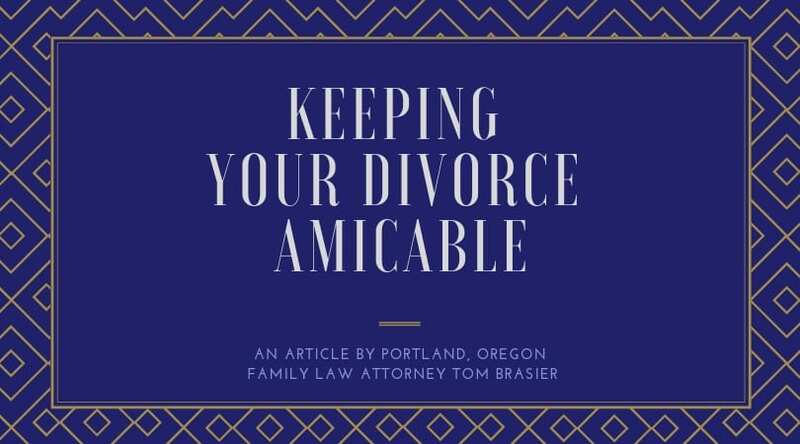 Keeping your divorce amicable will require the ability to let go of any hard feelings you have towards your spouse. Before starting to discuss details of your divorce with your spouse, make sure you are in a safe head space where you feel you can proceed with a logical, rational conversation about details. Nothing will derail a possibly productive conversation faster than an veiled insult or jab at your spouse. Not only do you need to be prepared to avoid making any emotional punches, but you also need to be prepared for the inevitable button pushing your spouse will engage in with you. While it is understandable to have strong emotions during a divorce, it is important to keeping the process amicable to find a way to be in touch with these emotions and cope with them before any discussions with your spouse. This will look like different things for each individual, you may have a great friend you can get together with privately, a therapist, or some activity that helps you relax or blow off steam. The important thing is to come emotionally prepared for any interactions with your spouse. 2. Concessions are key in an amicable divorce. I mentioned above that you will need to make many concessions. Almost nobody leaves a divorce with everything they wanted, or felt they deserved. Often, the only way to even get close to getting everything you want is to spend countless thousands of dollars on a super aggressive attorney, and even then hope that your day in court goes off flawlessly. The more aggressive your demands, the less likely you will be able to keep your divorce amicable. Both sides need to be prepared to make a LOT of concessions if you really want to avoid having any hostility in your divorce. In other words, be willing to negotiate in order to preserve the peace. 3. It takes two to tango. Unfortunately, this saying applies very closely to divorce cases. If you want to have an amicable divorce, you will need your spouse on board with this as well. If they want to scorch the earth and make you suffer, or if they just insist on being given more than you can concede, then you need to accept the reality that your divorce won’t be very amicable. I can’t tell you how many clients I have spoken to who are reasonable, mature people. They are willing to make solid concessions to avoid an ugly divorce. All they want is for their spouse to just come to reality a little bit. Unfortunately, some people follow this pipe dream to their own peril. Sometimes, if your spouse is intent on not being amicable, the smart decision is to accept the reality they are forcing upon you, and proceed accordingly. Holding out hope that if you just try one more time to convince them often results in significant hardship and loss, or at the least, a huge waste of time. Returning to the idea of a divorce being an emotional nightmare, you will want to be prepared to discuss only the specific details without the feelings getting in the way. Put another way, divorces often come down to a series of small “cost vs. benefit” decisions. There is a cost to everything you want in a divorce. Sometimes that cost is emotional. Sometimes that cost is financial. At times that cost is in the form of time with the children, or control over decisions. Other times the cost is in terms of how much you will have to pay your attorney to pursue a certain course. For example, let’s say you start talking to your spouse about your divorce. You propose splitting time with the children equally, but she wants to have them with her 75% of the time. In order to keep the divorce amicable, the two of you will need to be able to talk through this in a healthy way, which means at least one of you will need to adjust your demand. In other words, if you choose to pursue an aggressive course to fight for equal parenting time, there will be a cost in terms of the emotional toll it takes on your family to go through a legal battle, a cost in terms of the amount you pay a divorce attorney to pursue this course, and other costs as well. There is the possible benefit of winning 50/50 time, and also the possible outcome that you won’t get what you want despite your effort. In trying to keep things amicable, turning yourself into robot mode, where you analyze the risks and rewards you face by either agreeing to give in, or fighting for what you want is key. Be prepared to think as logically as possible about the situation so you can decide if the concessions you will need to make to keep things amicable are worth the risks and rewards available. Talking with an experienced divorce attorney can always help you gain a better idea of what those risks and rewards might be based on your unique situation. 5. Some situations can’t be amicably resolved. I touched on this above, but it is worth going into more depth here. As much as everyone would love to have an amicable divorce, there are some situations where that just isn’t possible. Often, this is caused by your spouse just making demands you can’t accept. Other times, your situation might result in a total impasse. For example, let’s say you followed your spouse to Oregon from where you were born and raised. Let’s say now that you are getting divorced, you absolutely and without question have to return to your home so you can have support to get back on your feet. Well, if your spouse is unwilling to let the children move with you under any circumstance, you may just be at an impasse. You can’t agree to stay here, or leave the children with your spouse full time while you move back home, and your spouse can’t agree to let the children move across the country. While this situation may not apply to everyone, there are countless examples of impasses that just can’t be resolved without a judge’s decision. Not every situation can be amicably resolved. That doesn’t mean however that it needs to be nasty. 6. Make use of professionals. Many people feel that hiring an attorney means they can’t have an amicable divorce. In fact, the opposite is often the case. Frequently, people hold off on hiring an attorney because they are worried that it will turn everyone nasty. Often however, the attorney’s job becomes as a peacekeeper to help you reach an amicable resolution. Spouses can get on each other’s nerves. They can set out with the best intentions to have a nice conversation, but before long the undercurrent of years’ worth of frustration and hurt feelings turns that well intentioned discussion into slammed doors and harsh words. Remember, family law attorneys are not emotionally involved in your life. If you and your spouse each have good, respectful attorneys, they can be your robots. A good divorce attorney is a chameleon, matching their demeanor to the situation’s needs. If the problem is that you and your spouse both want an amicable divorce, but that you can’t seem to get from point A to point B, hiring good attorneys will often result in a quick, courteous resolution with less hostility than trying to work it out without professional help. Be careful in hiring your divorce attorney. Most family law attorneys are great people who truly want to be of service in difficult situations. Be careful though not to hire someone who seems too aggressive. Aggressiveness in an attorney is a good trait, provided they start looking for peaceful resolutions before moving on to fighting instincts. Some attorneys tend too far towards the early fight instincts. So long as you interview your potential attorney well, you should be able to find a professional who can act as the necessary buffer to keep your divorce amicable. 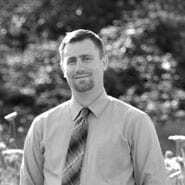 Tom Brasier is an experienced family law attorney serving the greater Portland, Oregon area. He works to provide excellent family law services including divorce, custody, and restraining orders. To set up your free consultation call 1 (503) 855-4777 or use the contact form below. The advice offered here is not to take the place of the advice of an attorney that knows your situation. We look forward to working with you to find solutions to fit your needs. You can find Brasier Law on Twitter, Facebook, and Instagram stop by and give us a follow for updates on when we have new articles up.